I hope everyone is having a fun and relaxing summer. While you were soaking up the rays down the Cape or enjoying a delicious lobster roll at Woodman’s in Essex, the justices of the Supreme Judicial Court remained busy deciding cases. A few weeks ago, in Shiel v. Rowell, the Court was asked to overrule centuries-old common law that a landowner may not be held liable for damage caused to a neighbor’s property from a healthy tree. In an opinion interspersed with amusing tree puns, the justices declined to uproot precedent, and reaffirmed the “Massachusetts Rule” that if a healthy tree causes damage to a neighbor’s land, there is no liability. However, the neighbor may prune or remove encroaching branches or roots. In the case, Keli-Jo and John Rowell own residential property adjacent to Mary Shiel. On the Rowells’ property sits a 100 foot tall sugar oak tree with branches reaching over Shiel’s property. Shiel filed a complaint with claims of private nuisance and trespass against the Rowells after the tree caused algae buildup on the roof of Shiel’s home and the Rowells refused to cut it down. Shiel sought money damages for the damage to her roof and an injunction demanding that the overhanging branches be cut back. A judge in Quincy District Court dismissed Shiel’s lawsuit, citing the Massachusetts Rule above. The case went up on appeal, with Shiel urging the SJC to adopt the “Hawaii Rule” which allows a neighbor to require the tree owner pay for damage and cut back branches and roots if the tree causes, or there is an imminent danger of it causing, harm to the neighbor’s property. Shiel reasoned that the Massachusetts rule is outdated because today people are living in closer proximity to one another on smaller tracts of land than they were back in the 1800’s. While the justices acknowledged the recent need for changing other aspects of premises liability (eliminating distinctions between licensees, visitors, trespassers, for example), they saw no drastic change in the Massachusetts landscape to overrule over a hundred years of legal precedent. The law on tree responsibility remains the same today as it was in 1890. Now, the question I get the most from homeowners is what happens if a neighbor’s tree branches or roots are encroaching onto my property and causing damage? The SJC reaffirmed in Shiel that property owners may still legally cut encroaching branches and roots. This is true whether the tree is healthy or diseased. The SJC also restated the rule that a neighbor is always responsible for damage caused by an unhealthy tree regardless of whether it encroaches or not. Attorney’s Advice: If you are dealing with a dispute regarding trees, especially along the property line, it’s a good idea to consult an attorney. Always get a survey or plot plan performed before you cut any trees. There is a Massachusetts law which provides a “triple damage” penalty for the malicious cutting of trees. I was honored to talk about boundary line disputes on this week’s Real Estate Radio Boston broadcast on WBZ 1030, hosted by Rick Scherer and Ali Alavi, Esq. The broadcast is below. Just click the Play button to listen! Or click on this link: Real Estate Radio Boston | Richard Vetstein. Tune into the broadcast every Saturday night from 8pm-9pm on WBZ 1030 AM. It’s a fantastic show! In a tragic case out of Somerset, Massachusetts reported by Massachusetts Lawyers Weekly, a woman’s estate has recovered a $150,000 wrongful death settlement after she dropped dead when her neighbor cut down a row of trees which she and her husband planted 40 years ago. According to Taunton lawyer Claudine A. Cloutier, who represented the woman’s estate, the neighbor hired a worker to remove some of the trees. When the woman discovered they had been cut down, she apparently became emotionally distraught. Her son found her dead in a chair the next day. There were no signs of trauma. Her estate brought negligence and tort claims against the neighbor, alleging wrongful death partially caused by stress arising from the destruction of the plants. The case went to mediation, and was settled before trial for $150,000. Damages are assessed that either the market value of the timber or the replacement cost of the trees. Replacement cost typically requires the assistance of an expert arborist or landscaper. In a case out of Martha’s Vineyard, the appeals court upheld a $30,000 award for the replacement cost of 10 mature oak trees. Upon a finding of maliciousness under the tree cutting law, those damages were tripled. Before cutting, trimming or pruning trees on or near your property line, it’s always a good idea to consult your plot plan or survey and speak to your neighbor before taking out the chain saws. Richard D. Vetstein, Esq. is an experience real estate attorney who has litigated numerous illegal tree cutting cases. If you are dealing with a Massachusetts unlawful tree cutting or trimming situation, please contact him at 508-620-5352 or via email at info@vetsteinlawgroup.com. The old Robert Frost poem Mending Wall goes “Good fences make good neighbors.” But a neighbor can quickly turn from good to bad when a they maliciously construct a “spite fence” on the property line. And that includes Sarah Palin who installed this 14 feet monstrous fence at her Wasilla, Alaska home. What Is An Illegal Spite Fence? Spite fences are those which neighbors put up extremely close to the other neighbor’s property for the purpose of annoying or inconveniencing the neighbor, and not for any legitimate other reason. In certain circumstances in Massachusetts, courts can rule that certain types of fences are illegal “spite fences,” and order that they be taken down, decreased in height or award damages to the complaining neighbor. A fence or other structure in the nature of a fence which unnecessarily exceeds six feet in height and is maliciously erected or maintained for the purpose of annoying the owners or occupants of adjoining property…. Whether a fence is an illegal spite fence depends on the circumstances. Usually spite fences are erected where neighbors have been fighting or in a legal dispute of some kind, and the fence is installed as a form of revenge or pay-back. In the vast majority of towns and cities, fences are allowed to be up to 6 feet tall. If the fence in question is over 6 feet tall, and there is evidence that it was installed maliciously, it may be an illegal spite fence. In a recent dispute on Concord Street in Wilmington (see photo right), a neighbor has installed a very ugly make-shift plywood spite fence with a blue tarp attached. This precipitated a proposal to pass a new fence by-law in Wilmington. I’m not sure of the circumstances surrounding this particular fence, but it is certainly borders on a classic spite fence. In another reported case, the Land Court ordered a neighbor to take down a makeshift fence with spray painted signs and no trespass warnings. Most folks who erect spite fences will claim the fence is for privacy, but if the home faces an entirely different direction, you can debunk that as a cover for maliciousness. Neighbors may also try to get around the Spite Fence Law by installing a row of trees over 6 feet tall behind the fence. These, too, may be considered illegal. 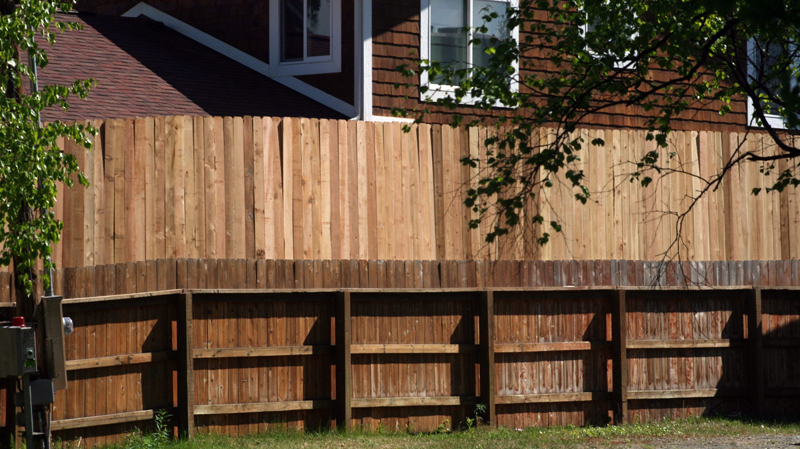 What Can I Do If My Neighbor Puts Up A Spite Fence? Under the Spite Fence Law cited above, you can sue your neighbor and ask the court to take down the fence and also seek damages. Under this law and upon a showing of “irreparable harm” the court has the power to impose an injunction ordering that the fence be taken down or reduced to 6 feet tall. Alternatively, the court can award damages. The difficulty with these cases is that you need to prove you neighbor acted “maliciously” in installing the fence. You will need to marshal evidence to prove that, and that’s where an experienced Massachusetts real estate litigation attorney would add tremendous value. These cases are complex and judges will often require evidentiary hearings before imposing an order taking down a fence. It’s not a “do it yourself” type of situation! If you are struggling with a boundary line issue or a potential “spite fence,” don’t hesitate to contact me at info@vetsteinlawgroup.com. I have successfully litigated quite a lot of these cases. Richard D. Vetstein, Esq. is an experienced Massachusetts real estate litigation attorney. Mr. Vetstein frequently represents Massachusetts residents in contentious boundary line, fence, and adverse possession cases. Click here to read about my most recent adverse possession trial victory. Robert Frost ‘s famous poem The Mending Wall says “good fences make good neighbors.” When that fence encroaches over a neighbor’s property line, however, that good neighbor can turn nasty very quickly. When boundary or encroachments disputes arise, a little known legal doctrine often comes into play: adverse possession. Adverse possession is a common law concept in Massachusetts under which homeowners may lose title to their land by sleeping on their property rights for 20 consecutive years against a neighbor who has taken actions contrary to their property interests. Yes, a neighbor can effectively take over ownership of your land if you sleep on your rights. Massachusetts adverse possession law reflects a public policy aimed at inducing landowners to actively protect their land. The classic example of adverse possession is a neighbor who puts up a fence or paves a driveway several feet over their neighbor’s property line, without permission, and this “adverse possession” continues without objection for 20 consecutive years. Despite the fact that the neighbor’s fence or driveway encroaches the property line, under the adverse possession doctrine, the property owner may lose title to the disputed strip of land by not doing, saying or even knowing anything about it. A landowner can obtain adverse possession only by filing a lawsuit and establishing several elements of the claim. (My property law professor used a handy acronym called OCEAN to help students remember them). The use of another’s land must be Open, Continuous (for 20 years), Exclusive, Adverse and Notorious. Each element has its own specific requirements, and all adverse possession cases are very fact-specific. The law does not favor adverse possession, so the burden of proof on the claimant is relatively high. Adverse possession can also occur through multiple prior owners during the 20 year period under a theory called “tacking.” Adverse possession can also be in the form of an easement, or merely a right to use property, called a “prescriptive easement.” This could apply to the gamut of utility, pathway, or access easements. Surveys typically form the genesis, and play an important role in, adverse possession cases. The parties must know where the true lot lines are on the property. Sometimes, there are disputes as to the survey in cases of old, poorly laid out lots. Remember that even if you believe the neighbor is wrong about the lot line, it is against the law in Massachusetts to remove survey stakes. (Mass. General Laws Chapter 266, Section 94). Also under Massachusetts law, a surveyor is allowed to enter upon your land, with reasonable notice, for purposes of completing a survey. The key to preventing adverse possession is to be proactive regarding your boundary lines and property rights. If you suspect an encroachment, obtain a full instrument survey, not a mortgage plot plan which can be inaccurate. If an encroachment is found, consult an attorney for further advice. For prescriptive easements, record a statutory Notice to Prevent Acquisition of Easement. Note: this notice will not prevent a claim of adverse possession to the entire land. The more land you own (especially raw woodlands) the more proactive you need to be. Lastly, when buying new property, consider getting an enhanced title insurance policy which has coverage for encroachments and boundary issues, at a small premium over standard rates. Given the high cost and low supply of land in Massachusetts, adverse possession disputes often wind up in litigation. Adverse possession litigation can be expensive because these cases are very fact-specific and require a fair amount of witnesses, factual investigation, title research, and even expert testimony. Adverse possession cases are generally difficult to win, but they can be successful with the right facts and good preparation. The Massachusetts Land Court hears adverse possession cases along with the Superior Court. Depending on the facts of the case, the plaintiff can do a bit of “forum shopping” between the two courts. Richard D. Vetstein, Esq. is an experienced Massachusetts adverse possession attorney who’s handled numerous adverse possession cases and trials in Land Court and Superior Court. Please contact me at rvetstein@vetsteinlawgroup.com or 508-620-5352 if you are dealing with a Massachusetts adverse possession dispute.